About 160 pupils take private instrumental lessons at Dundalk Grammar School. Lessons are available to all pupils who commit to a full year of lessons. Pupils come out of class to attend their lesson and Music Teachers rotate their time-tables so that pupils don’t miss the same class each week. The cost for 30 half hour lessons is €450 payable in two installments — this will be added to the school bill. This price has not been raised in the past 6 years. The Music Department has some instruments which can be hired out to pupils for a year while they are deciding whether or not to continue with the instrument. The hire of instruments costs €40 per term. Please contact Ms. A. McGuire to find out about availability of instruments for hire. If a pupil is interested in learning an instrument which is not on the list, please submit your request and if there is enough interest, the school may be able to arrange it. All pupils have the opportunity to perform at school assembly. It has been said that playing in front of an audience is better than 20 lessons with the best teacher in the world! 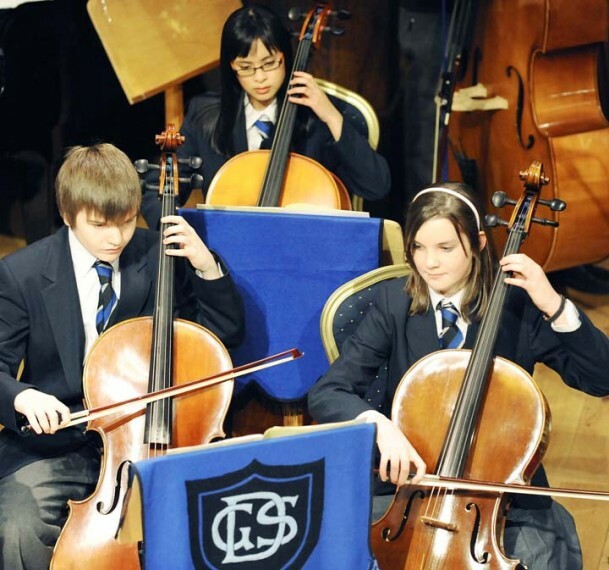 Pupils can take exams on their instrument through several examining boards, including: The Royal Irish Academy of Music, Trinity College of Music and The Associated Board of Royal Schools of Music. Pupils learning an instrument are also encouraged to attend a theory of music class. To book instrumental lessons, or for more information, please contact: Ms. Aisling McGuire Head of Music [email protected] Tuition available in: Voice, Strings: Violin, Cello, Double Bass Guitar (Classical and Acoustic) Harp Brass: Trumpet, Trombone Woodwind: Flute, Clarinet, Oboe, Saxophone Percussion: Drum Kit Piano, Electric Keyboard Theory of Music & Composition.